Well, the latest release coming from iSoftBet’s creative kitchen will definitely draw your attention, because there is plenty of unusual things that cannot be found in modern video slots. The Lucky Stripes video slot is a combination of an old-school one-armed bandit and a modern game. The 2019 release features three reels and only one payline, which is a bit peculiar. Your task will be to form a matching line or a Stripe on a payline and win different prizes. Also, it is possible to trigger the Rockin’ Respins feature, where you can trigger loads of respins. We will not talk about the symbols populating the reels, because there are no symbols to talk about. Unlike in traditional fruit machines, the good people of iSoftBet decided to use lines or Stripes instead of Lucky Sevens, Bar symbols, Fruits and so on. There are four different regular Stripes you can match on one payline: Gold, Pink, Green and Blue. Each of these lines can get you different wins. Also, there is the Wild Stripe that resembles the rainbow and will substitute for all other Stripes but the Logo Stripe, which triggers respins. This is probably one of the easiest rules of the game we ever had to explain to punters. The 2019 release features three reels, three rows and benefits from only one payline, which is placed in the central part of the reel grid. To win a payout, gamers have to land matching Stripes on all three reels. The betting range is not that wide, because you can wager as low as £0.01 and as high as £1 per single spin. Set the coin value, check out Paytables, activate up to 1,000 automatic spins in Autoplay, or simply hit the Spin button and see what happens. There is only one additional feature on the offer in the iSoftBet product, and it is called Rockin’ Respins. To trigger the feature, players need to land two Wilds on reels 1 and 3 and the Logo Scatter Stripe on reel 2. Once this happens, you will get your respins. The Wilds remain locked on reels 1 and 3, while you wait for any of the Stripes to land on reel 2 and to collect your reward. The feature continues until gamers land the Collect symbol on reel 2. Now, we mentioned earlier that all Stripes offer different kinds of prizes. Complete the Golden Stripe and you will win 30, 50 or 100 times the bet. The Pink Stripe offers 15, 20 or 25 times the bet. The Blue Stripe will get you 8, 10 or 12 times the bet, while the Green Stripe offers 2, 3 or 5 times the bet. During the Rockin’ Respins feature, you can win up to 100 times the bet in a spin. Lucky Stripes’ RTP is 95.92%. The best thing about a video slot as simple as the iSoftBet title is that it can be played across all devices and players do not have to worry whether the quality of the game will be different on different devices. The mobile version is completely the same as the desktop one. It will take you a bit of thinking before you decide whether Lucky Stripes is a good video slot or not. There are fun parts in it, including the awesome soundtrack and the Rockin’ Respins feature, where every respin may get you 100 times the bet. On the other hand, there is only one payline on the offer and it is not easy to win payouts with only one payline. If Lady Luck is on your side, you can win big, but if not, it will take you ages before you land a win or trigger respins. Bottom line is that everybody should try out this weird video slot, but it’s up to you for how long you will play it. 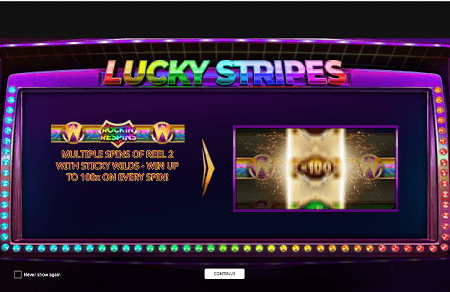 Play Lucky Stripes slot at King Billy Casino!